This heart is no less than a kid's, singing to the pure kiddo tunes, and still whispering.... Well, does anyone of you recall this song from 'Makdi?? I always loved this number because of this 'taaun taaun', such funny lyrics! Ab agar dil bacchha hai toh sabse pehle kya khaega....ammm... ice-cream.... chocolates... brownies... burgers... french fries...nah!! If you ask the kids of recent times, for sure that has to be something from the list above but the kids of our age had always a run for Pani puri, Chaat, Falooda, Gota ( Ice balls dipped in colorful syrups), Bhel Puri, Paav Bhaji...what not!! For long, really long, I've been thinking to write this post on one of my favorite savory stuff that I can't eat on the roadside thelas/canopies anymore, so there has to be a way where I can still drool upon this utter spicy n tangy dish without any guilt. 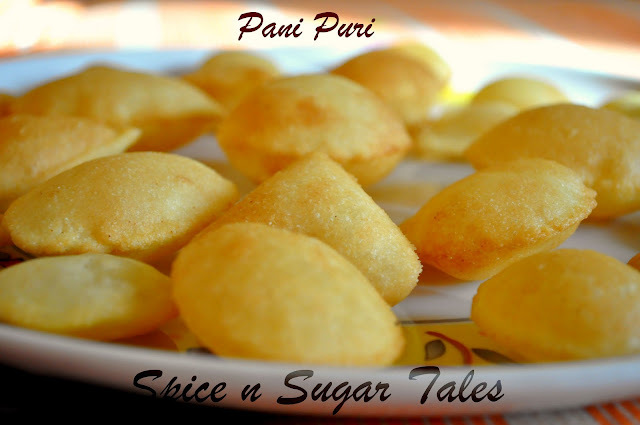 Pani Puri is a very famous street food in India, known by different names, as Puchka in Kolkata, Pani Puri/Batasha in Western India and Gol Gappa in North India. 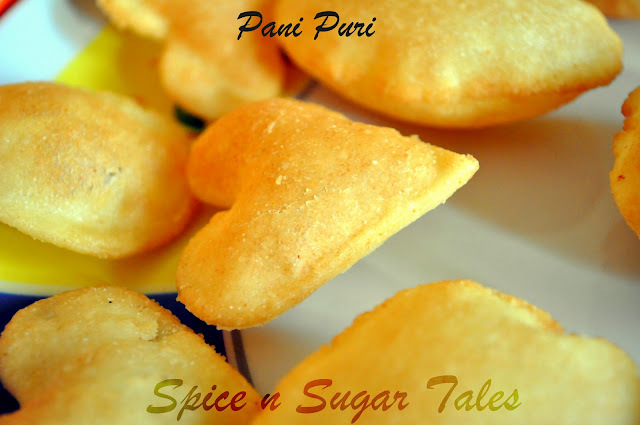 For making Puri, take all the ingredients and prepare a soft dough ( like that for pooris). On the other hand, let's prepare the 'Pani'. Take mint leaves, coriander leaves, green chillies and tamarind paste in a blender and juice out using little water. Sieve it to remove any fibres or coarse particles. Add all the spices and water to it finally. The tangy pani is ready. Take a big portion of the dough and roll it into a thin big circle ( not too thin) using all purpose flour for dusting. Take cookie cutters and take out shapes as you want. Generally, the puris are round or slightly elongated. You can use a sharp edged small steel glass or a small jar cap to cut small circles. If you don't have any of them, then do not roll a bigger portion, rather take very small parts and roll them in very small sized round puris ( like how you make chapatis). This is cumbersome for sure, but better something than nothing. Here, if the rolling is not symmetrical and uniform, the puris won't puff up. Take oil in a kadai and heat it. When enough heated ( and not fuming, as this would burn them), transfer the puris into the oil one by one gradually. Keep the flame on medium. After dropping in the first one in oil, press it a bit with a laddle so that it puffs. Then change the side after 20 seconds or till golden brown and fry it on the other side as well. When fully done and crisp, take it out on a tissue paper/roll and tap out the excess oil. Repeat the same with others. 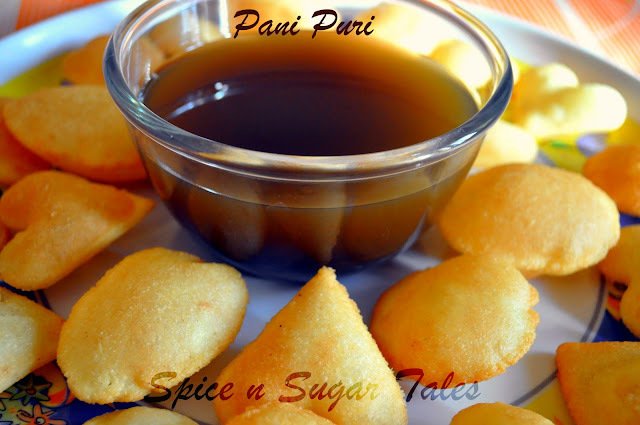 Let the puris cool down in a wide open plate so that no moisture lingers within. They will go crisp once they have cooled down and settled in the plate. Now let's make the filling/masala. Take boiled and peeled potatoes, mash them and add all the spices. Add chopped onion and keep it ready. Serving time: Take a puri, pit the top, fill in the masala, throw in some tamarind/green chutney, immerse generously in the tangy pani and gulpppp!! If you do not have tamarind/imli, you can use 'Amchoor/ Dry Mango Powder' in place of that. Adjust the sourness as per your need by increasing or decreasing the amount of tamarind if required. In absence of fresh mint leaves, dried and crushed leaves can also be used, though they will be slightly less flavorful. If you want the pani even more hot, push in some cloves while mixing/juicing. 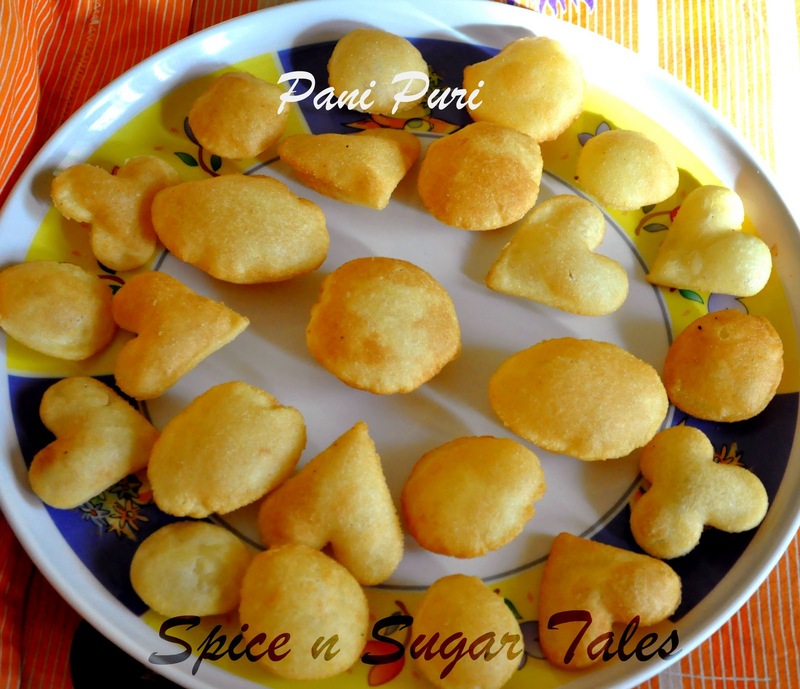 While frying, do not keep piling puris one over the other else they will go moist and soft. Rather spread them out in a scattered fashion. Never attempt this in a humid, rainy weather else you will complain of the puris going soft. Some people make puris out of atta and maida too (even do I) but Sooji ones are crispier. Never refrigerate the puris; rather keep them in a closed container outside after they have cooled down and have gone crisp. The water can be refigerated for a day or two. Tamarind chutney and green chutney surely add in the flavor. You could use the market ones or the home-made ones. Woooooow......beautifully done.......Mouthwatering & very innovative shapes. Thank you so much for sharing your link with Sweet Heat! I can't wait to publish this in the round up! Love this any time...yummm...First time here...following ur space..
Now who can resist crispy puris with lip smacking & tangy chutney!!! Lovely hints on making pani puris too...Bookmarked!! I have never made puri at home .Looks awesome ! 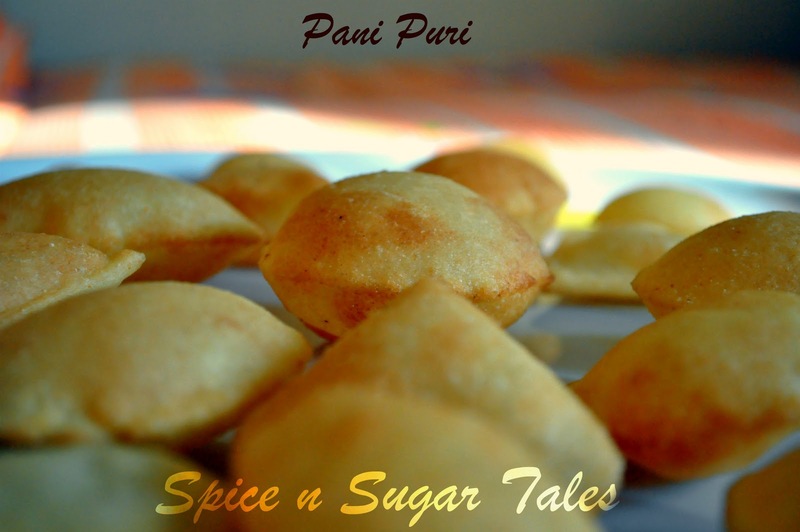 pani puri looks delicious... fantastic clicks... bookmarking it..
loved your shapes! 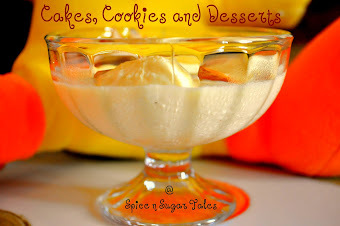 !delicious and perfectly done recipe.. These pani puri's look perfect. I wish I could pick one up... Love the heart shaped ones that's very innovative and great idea of valentines day! Ohh my!!! My most favorite snack in the world! Never seen then such beautiful heart and flower shapes :-) Bookmarking this recipe! 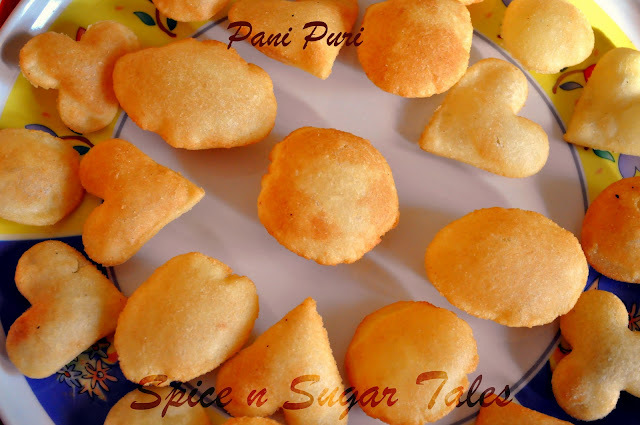 I love these cute shapes you have given to the pani poori's,looks lovely. Hi Anjali, Loved you gol gappa's too mouth watering a recipe..reminds me of delhi's street food...I an unable to find real great gol gappa's here in bangalore....So I also prepare them mostly at home now!! Hi ANJALI, Tried out this today....turned out superb..a hit in my family.